Step 1: Cold. Step 2: Snow. At least, that's the way it's supposed to work in the wintertime here in New Jersey. Of course, even the best laid schemes of Ol' Man Winter have left Garden State snow lovers rather disappointed this winter. For the umpteenth time this year, we can't rightfully call either of our impending winter storms a "snow storm". The first one is too minor. And the second is more accurately a "mix storm". Or a "quick hit of snow then a lot of rain storm". Even so, the timing of these two rounds of wintry weather will be incredibly inconvenient and could make for some really messy conditions during peak commuting times. Additionally, one area of the state could ultimately see enough snow to build a snowman after all. 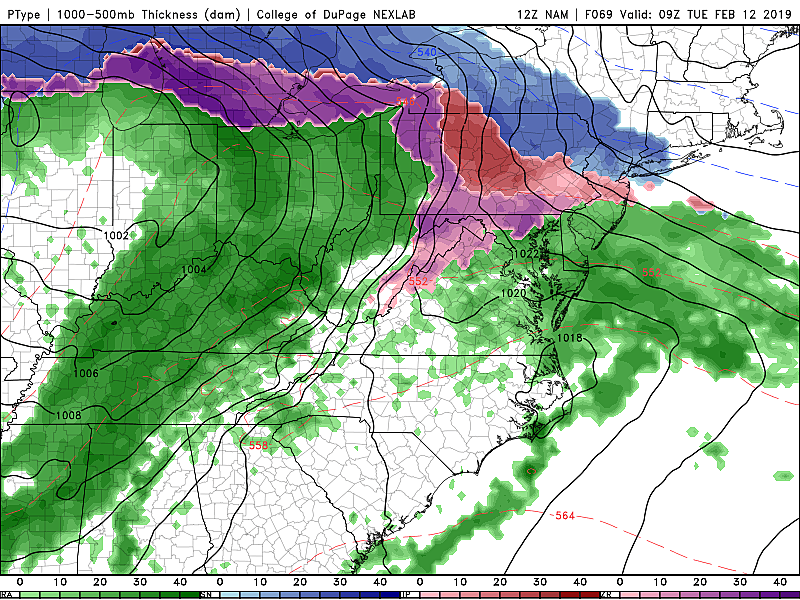 —Timing... First flakes around 10 p.m. Sunday. Light to moderate snow throughout the overnight hours. Final flakes around 8 a.m. Monday. —Totals... Everyone in the state could see a half-inch to an inch of snow accumulation. Around 2 inches of fresh snow will be possible in the bullseye around central and southern New Jersey. For the record, models have been pretty consistent in showing the most snow around the slice of NJ containing Ocean, Atlantic, Gloucester, Camden, and Burlington counties. South of that area (Salem, Cumberland, Cape May), there could be some mixing with sleet and/or freezing rain, which could lead to light icing conditions. —Impacts... Not a major winter storm. Not even a by-the-book "advisory" criteria storm. However, the timing is very inconvenient here. Things could get awfully messy on the roads by Monday morning's rush hour. School delays, quite possible. School closings, eh we'll see. —Confidence... Moderate to high. I'm feeling good about how the models have come around to this consensus solution. Everything I've read lately suggests a "conversational" or "nuisance" snow event. —Background... Following a lull in the snowflakes during the day Monday, our next storm system will approach from the west late-day. As this area of low pressure tracks eventually well to our north, it appears New Jersey will end up on the warm side of the storm — yet again, more rain, less snow. In addition, as a secondary low forms right along the coast on Tuesday, that rain could become very heavy at times. —Timing... Note: there could be ongoing wintry mix showers in far southern NJ through Monday afternoon. But the real push from this system will initiate first flakes around 6 p.m. Monday. Most or all of New Jersey will be under light to moderate snow by around Midnight. As warm air surges, southern, coastal, and much of central Jersey will change over to rain by 6 a.m. Tuesday. All of NJ will have turned to rain (heavy at times) by 7 p.m. Tuesday at the latest. Rain wraps completely up by 5 a.m. Wednesday. —Totals... A tricky transition from snow/ice to rain. The southern and coastal parts of the state will experience the least snow, probably on the order of 1 to 2 inches. A later transition will lead to a longer period of snowfall for inland central and northern New Jersey, so I'm leaning toward 2 to 4+ inches. —Biggest Concern... The corner of the state northwest of Route 1 may stay below freezing for even longer than forecast models are currently suggesting. (See timing section above: we may not see 100% transition until early Tuesday evening.) So heavier 6+ inch snow totals are a distinct possibility, especially at elevation. Worse, if we end up with an extended period of near-freezing-mark temperatures during the transition, freezing rain and/or sleet could cause for significant icing in the northern sector. —Impacts... Once again, it's all about timing. No matter what's falling from the sky — snow, ice, or rain — travel conditions during Tuesday morning's rush hour will be poor. Continued sloppiness is possible through Tuesday evening too. Again, areas to the north and west of about the Route 1 corridor will be the snowiest and iciest for the duration. Southern, coastal, and part of central New Jersey will be spared from the most significant issues. I'd bet we'll see some advisories and maybe even a warning issued for this second, more impactful storm. —Confidence... Low to moderate. On the one hand, I think we've narrowed down the potential storm scenarios. Bottom line: Snow/ice, changing over to rain. However, the timing and speed of the snow-mix-rain transition are especially challenging to pinpoint. And ultimately that is what determines how much snow/ice/rain any given location will see. As always, I will encourage you to blur your eyes and read between the lines in this forecast. Don't focus so much on the numbers, but rather my overall narrative. In other words, know that weather conditions Monday night into Tuesday are going to be pretty poor, no matter what. I've opted not to draw snow forecast maps for either wintry event at this time. #1 doesn't meet my usual "2+ inches or more" standard of publishing a map. And #2 is still low confidence enough that I don't want to promote specific numbers and lines just yet. Next weather blog update is scheduled for Sunday morning. In the meantime, stay warm and enjoy your weekend!